At first sight, this would seem like an easy question to answer but, in fact, it is not exactly clear whether tourism in Mexico in 2010 is increasing, decreasing or holding steady. Flows of tourists are affected not only by any changes in the situation of the destinations (receiving countries) but also by the situation at the point of origin. Most of Mexico’s international visitors come from the USA. This year, many potential tourists have opted to stay at home as a result of the current recession which started in 2008 and worsened in 2009. On the other hand, the recession may have diverted some tourists to Mexico from more expensive destinations they had originally planned to visit. Events within Mexico have also influenced the number of international tourist arrivals. The threat of H1N1 flu in early 2009 kept many international tourists away. Publicity about the violence associated with Mexico’s “drug wars” has accelerated in 2010 and almost certainly diverted some international tourists to other destinations. On the other hand, some tourists who planned their 2010 summer vacation on the US Gulf Coast may have opted for Mexico after the massive oil spill off Louisiana. An additional complicating factor is that international tourists only account for about 20% of Mexico’s total tourism revenue. While international tourism gets most of the attention, about 80% of tourism revenues come from national (Mexican) tourists. A tourist as someone who spends at least one night (and less than one year) away from their usual home. This definition ignores the precise reasons for travel. Hence, international tourism figures generally include travel for all purposes, including visiting family and friends, and business trips, as well as health and religious travel. All these factors make assessing trends in Mexican tourism an analytical challenge. In an August 2010 press conference, Mexico’s Secretary of Tourism Gloria Guevara presented data indicating that 818,278 international travelers visited Mexico in the month of June 2010 compared to only 605,435 in June 2009. This increase of 24% seems impressive, but requires closer scrutiny. International arrivals in January and February 2010 were 5.2% and 5.8% less respectively than the same months in 2009; revenues for those two months were up 21% in peso terms, but actually fell by 7.5% in dollar terms, because of the falling value of the peso. Arrivals in March 2010 were 2.7% higher than March 2009. Room occupancy rates (the percentage of available hotel rooms actually occupied) in 70 tourist destinations were up 11% for the first six months of 2010 compared to the same period in 2009. However, 2009 was a very poor year for tourism in Mexico. Only 21.5 million international travelers visited Mexico in 2009, compared to a record 22.6 million in 2008. Another major complication to the statistics is that they mask important regional differences. Tourism in some areas of Mexico is increasing steadily while it is simultaneously declining in others. For example, occupancy rates for the first six months of 2010 were up 30% in Morelia and 15% in Huatulco compared to the previous year. However 14 of the 70 cities monitored showed no gain in occupancy over the low numbers posted in 2009. All these percentage figures ignore any changes in hotel capacity over that time. For instance, if an additional 2000 hotel rooms are opened in a resort, the occupancy rate may decrease slightly, even though more tourists actually visited the resort. For cruise ships, a similar picture emerges. 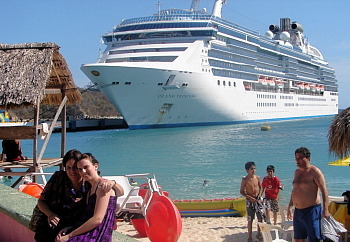 Though cruise ship visitors to Mexico were up in the first six months of 2010, they remain lower than the 2008 numbers for the equivalent period. So, is tourism expanding, or not? Overall, tourism in 2010 is certainly improving over the 2009 numbers, which is quite encouraging given the extremely negative publicity resulting from drug war violence. However, it is too early to say if the total number of visitors and revenues in 2010 will surpass the numbers for 2008. This will depend not only on publicity related to Mexico’s fight against drugs, but also on the speed and extent of economic recovery in the USA. In addition, the collapse of Mexicana airline means that there are currently far fewer flights into Mexico that there were at this time last year.